Note: While Cathy Potter is on Sabbatical, Louise is writing all the reviews. Cathy will return February, 2018. 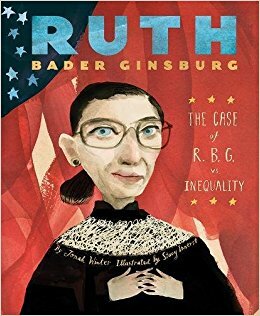 The cover portrait of Ruth Bader Ginsburg, the subject of Jonah Winter’s latest picture book biography is striking. Innerst's painting beckons readers to open and learn more about a remarkable woman who overcame many hardships to become the first female Jewish Supreme Court Justice. Winter presents Ginsburg’s story as a court trial. Not only would Ruth battle anti-semitism in 1930’s and 1940’s America, she would also come up against the attitude that only men needed a college education as she attended Cornell University, then Columbia where she graduated with her degree in law. The illustrations, made with gouache, ink, and Photoshop, use an earthy palette of browns, sepia, and gray with highlights of pinks and reds; a perfect compliment to the text. Back matter includes a glossary of terms and a lengthy author’s note. Perfect for including in any display of women for Women’s History Month. Jonah Winter's bios are always very well done. Looking forward to reading this one. I loved Debbie Levy's I Dissent!! Hi Maria -- I do enjoy Jonah Winter bio's, too. I especially enjoy how the artist's style merges with the subject.